and "Squeal" About Your Special Occasion! (Age) Oinks For (Name's) (Age) Birthday! (Name) Be A Ham, It's Your (Age) Birthday! (Name) Hope Your Birthday Is High On The Hog! (Name) I'm Hog Wild For You! Happy (Age) Birthday! (Name) It's No Big Squeal To Be (Age) Happy Birthday! (Name) Pig Out On Cake, It's Your Birthday! (Name) We're Squealing On You! Happy Birthday! Happy (Age) Birthday (Name)…You Big Ham! Happy Birthday (Name)! 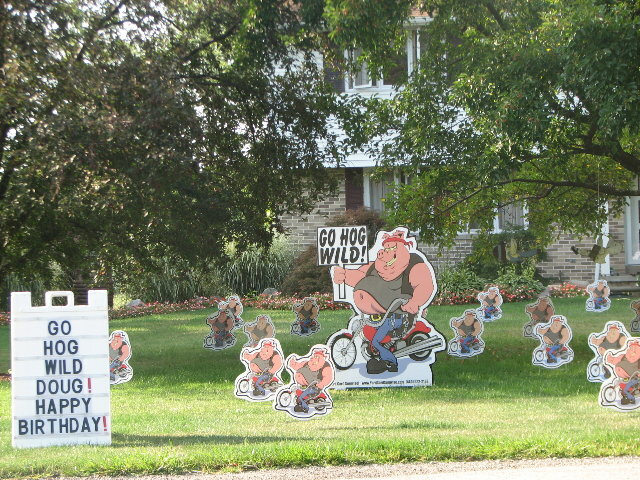 Pig Out And Go Hog Wild! Happy Birthday, (Name)! Act Like A Pig & Hog In The Spotlight! Hogs & Kisses On Your (Age) Birthday (Name)! In Pig Years You'd Be A Football - Happy (Age) (Name)! It's (Name's) (Age)! Happy Birthday Ham-Some! Snorty Snorty (Name) Is (Age)! Someone Squealed - It's (Name's) (Age) Birthday! The Porkers Are Here For (Name’s) (Age)! Happy Birthday! This Lil' Piggy Cried Hee-Hee (Name)'s (Age)! We’re Squealing On You! Happy (Age) Birthday! 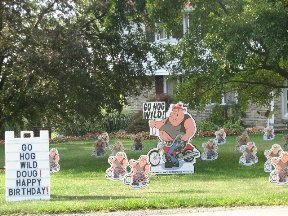 We’ve Gone Hog Wild To Wish You A Happy Birthday! (Name) - You're So Hot You're Bacon - Happy Graduation! (Name) Is Bacon His/Her Dreams Come True! Happy Graduation! (Name) Is Unsquealievable! Happy Graduation! (Name) You Did A Porkfect Job! Happy Graduation! (Name) You're Ham-azing! Happy Graduation! Congratulations To An Imporktant Person - (Name)! (Name) - Go Hog Wild In Your Retirement! (Name) - Happy Retirement Ham-some! (Name) - Hope Your Retirement Is Porkfect! (Name's) - Go Hog Wild In Your New Home! (Name's) - Good Luck Bacon Your New House A Home! (Name's) - Hope Your New Home Is Porkfect! (Name) - Hope You Feel Ham-azing Soon!